So what is a "methane hydrate", and how do methane and sea water mix to form the solid crystals currently growing on BP's 4-story containment dome? The beauty of basic science is that we already know something about these crystals, and that knowledge may be the key to overcoming this setback in the ongoing efforts to manage the BP oil spill in the Gulf of Mexico. Also known as methane clathrate, these crystals are a mixture of methane (CH4) and water (H2O) in which methane molecules are enclosed in a cage of water molecules (see the inset in the picture of the flaming ice on the left). 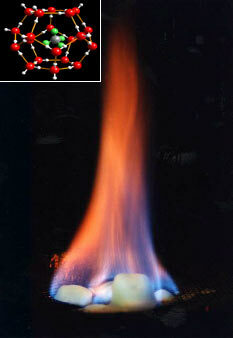 Together, these complexes form the crystalline solid (see Figure 2 below) known as methane hydrate. To understand more about how this mixture forms a solid at relatively high temperatures (Figure 3), let's first do a quick review of the physics of freezing and melting. Under different pressures and temperatures, many familiar compounds -- be they solid, liquid or gas -- can have strikingly different physical properties. While most people think of methane as a gas, if you get it cold enough under enough pressure, it will condense to form a liquid and/or freeze solid. Mixing it with water (e.g. on the sea floor), this happens even more readily and at relatively warm temperatures. But is it just the cold temperatures and high pressure causing the formation of these crystals? We can summarize all of these temperature and pressure dependencies with a phase diagram. Take for example, dihydrogen monoxide (aka, water). For a range of different temperatures and pressures, we can summarize the freezing, melting and boiling points in a diagram like the one below. Here each point on the plane corresponds to a specific pair of temperature and pressure values, and the curves trace out the boundaries between regions in which the phase of pure water is either a solid, liquid, vapor, gas or supercritical fluid. phase -- solid, liquid or gas -- for dihydrogen monoxide (water). Note the freezing point (green) is relatively insensitive to pressure. According to the Handbook of Chemistry and Physics (80th ed.) under standard atmospheric pressure methane transitions from a liquid to a solid at -182.4°C (it's melting point), and transitions from a liquid to a gas at -161.5°C (it's boiling point). Clearly the ocean floor isn't that cold, so this isn't a simple case of something like freezing point depression (which, for example, is what happens when you salt an ice covered step or sidewalk). Instead, methane hydrates freeze solid at a higher temperature than would sea water or methane by themselves because of the complex interaction between the methane and water molecules that forms the structures described above. Without going into too much detail, this crystallization happens because these "methane in a cage of water molecules" structures each fit nicely together, forming a different kind of crystal than solid water or solid methane alone. hydrogen bonded water molecules containing a methane molecule. Deep under water, these methane hydrate crystals form quite readily as can be seen from the phase diagram below. Recalling that the oil well currently spewing crude into the Gulf of Mexico is down around 5,000' (about 1.5 km) we see that this among many other marine environments permits the formation of this solid. In colder waters, you only need to go a few hundred feet to reach the point where methane hydrates can form. presented in terms of depth (instead of pressure) and temperature. Outstanding description of what is going on. Instead of junk shotting mud and golf balls into the BOP, what if cooled water was pumped in to create the very same methane hydrate crystals that clogged the first dome effort? Using the dome as an example using sea water, tap water and DI water and by controlling the temperature of the water one could probably guess how far along the riser the crystals would form. Once the crystals form and slows the flow, the plan of then pumping cement into the well can be tried again. If the water didn't work maybe it could be cooled at the injection site with a liquid gas or maybe something to cool the liquid the way the flanges of the dome acted like heat sinks. Or some other material could be used with a vary low freezing point that would also cause clatherate crystal formation of the methane (liquid amonia? sulfure dioxide?) sounds like something someone smarter than me would be able to make work better than rubber and golf balls. Interesting thought, but I would imagine the crystallization rate is too slow under those conditions, and pumping in something that would become a stronger solid (e.g. cement) would be as easy or easier. If a flexible net-like structure were devised, with the "string' or filaments of the net specially developed to encourage crystallization, could not a large "net' be lowered over the gushing leak that would turn solid enough as it was lowered to seal the leak like a blanket. Then you would pile massive solids on top to keep it in place. ? ?